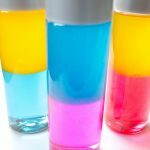 Have you ever wondered if there was a way to make a rainbow sensory bottle — a liquid one that won’t run all together right away? I’ve been keeping an eye out for the perfect one for a long time, and I finally figured out a way to make one! It’s not quite liquid, but it’s pretty close to it. The layers do blend over time and through play, but overall, it holds up really well. Update: After about six months, the colors had blended completely. 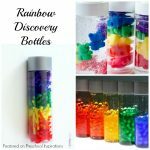 This rainbow discovery bottle or rainbow sensory bottle is a perfect addition to a rainbow theme, weather theme, or while learning about St. Patricks Day. But honestly, I think rainbows are best to study about any day of the year! They’re a fantastic addition to any preschool curriculum. 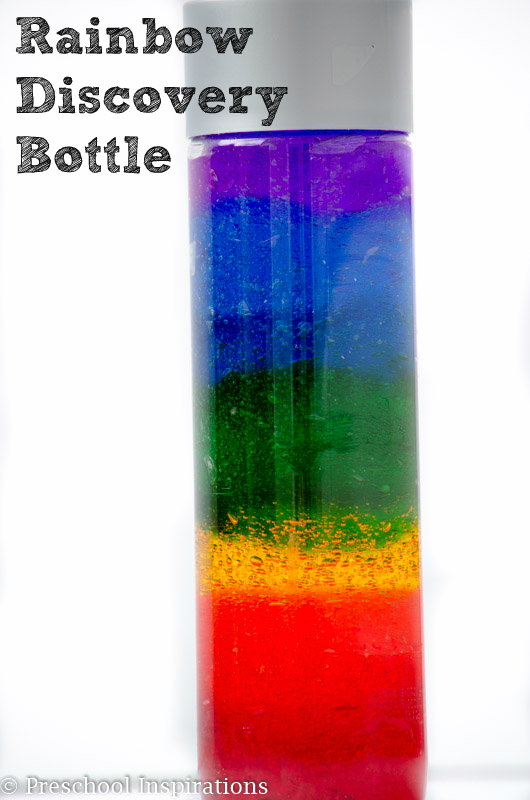 I’ve even include a rainbow sensory bottle video below so you can quickly watch how to make one! 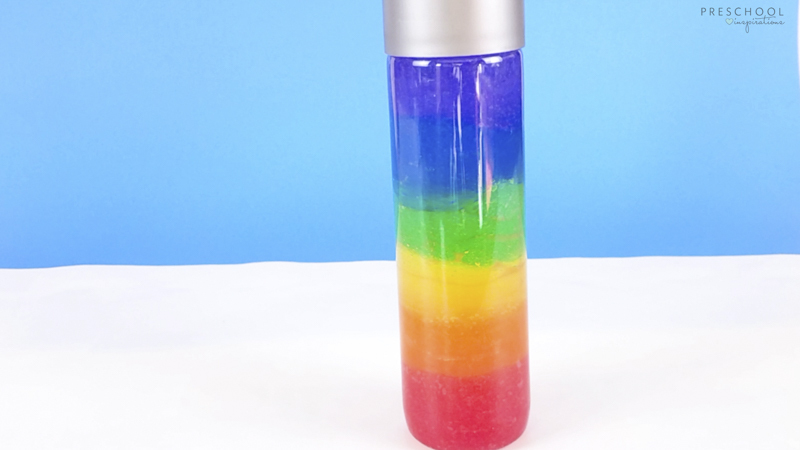 We love the rainbow layers of this rainbow sensory bottle, and we just love rainbows. Period. Rainbows and preschoolers go together like cookies and cream or sunshine and lollipops! While most of my discovery bottles are really simple to make such as my alphabet sensory bottle or rainbow counting bears discovery bottles, this one took some trial and error. I recommend making this when you have an hour block of time, and I suggest buying double the ingredients….just in case. We used a 16.9 fl. oz. VOSS plastic water bottle. I write about where I find VOSS water bottles and what good substitute bottles are over on my post about How to Make a Perfect Sensory Bottle. But the quick answer is that now Amazon is about the best place to buy a VOSS water bottle because it’s hard to find them at stores, or the glass ones are available and the plastic ones aren’t. I just trust Amazon now. When it came to the hair gel, I splurged and got extra. I have the kind from the dollar store. It’s the worst when you are in the middle of making a sensory bottle and run out of ingredients! I used two full containers of hair gel, which totaled 32 ounces. While only 16 oz of gel would fit into the bottle, I couldn’t use some of the hair gel because it was too dark when I mixed it. That’s where having double the ingredients comes in handy! Liquid watercolor is not widely available. You can find it easily online through Discount School Supply or Amazon though. Some school supply stores and craft stores have recently started carrying them. I would call ahead before making a trip though! 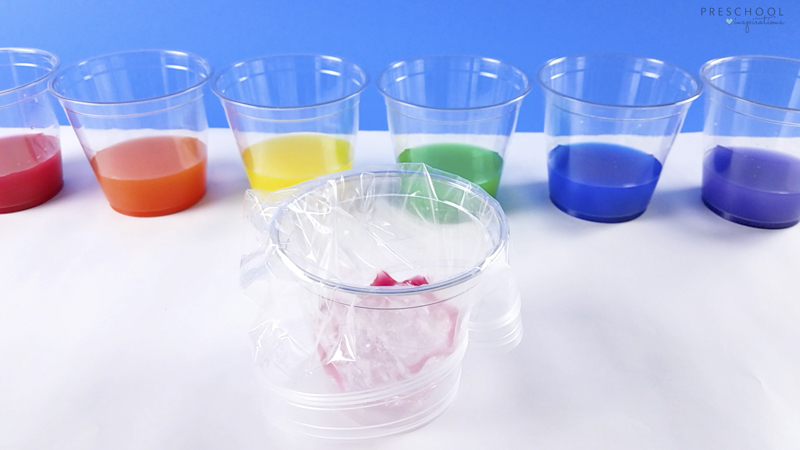 OR you could make your own liquid watercolor! This DIY liquid watercolor recipe is super easy and works great for this recipe too. I bet you could even use food coloring with this. I haven’t tried it, but it seems like it would work. I just typically avoid it since it does stain. Mix just under 1/3 cup or 75 ml hair gel with one liquid watercolor at a time in a clear container such as a plastic cup or a glass. Blend the hair gel and the liquid watercolor until you get a solid and even color. I recommend putting it in a clear cup with a plastic bag inside. It will make clean up a cinch too! Start with a little liquid watercolor and add more as you go. The darker colors such as red, green, blue, and purple should be pretty light. Otherwise, they will look nearly black in the bottle. Tip: Make slightly more of orange and yellow as the other colors will cover them some as you can see in my own bottle. Next time I’ll be sure to do it that way! Squeeze the colored gel into the VOSS bottle. Take the first color and squeeze it into the bottom of the bottle. You could start with red or purple. 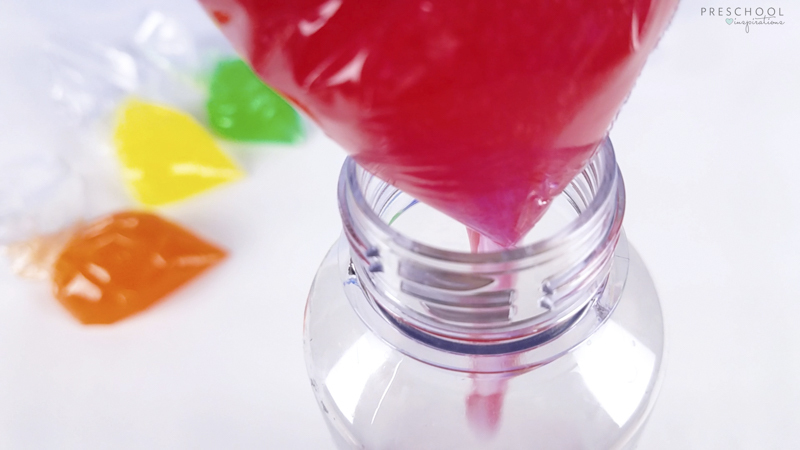 If there is colored gel that got on the side of the bottle, wipe it off with a paper towel. I used a mini spatula to push the paper towel inside and then wiped it out. Next, put in the next rainbow color. Repeat until all colors have been used. And don’t forget that you want more orange and yellow because they get eaten up by the other colors. 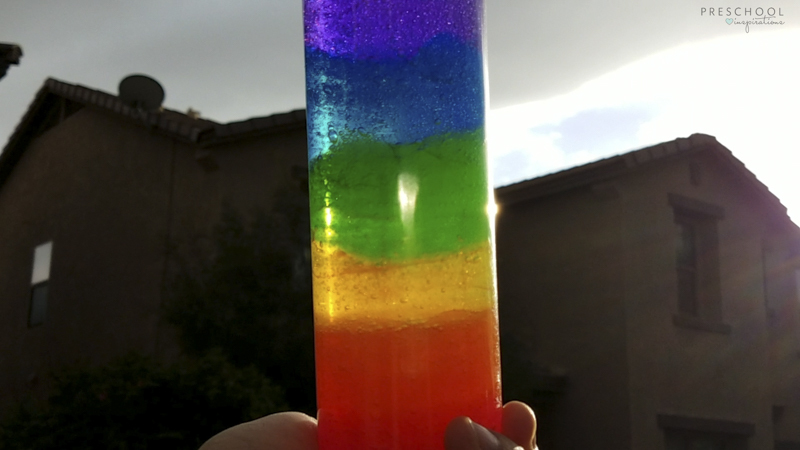 Once you have all of your colors inside and have filled it to the top with gel, it’s time to play and ooooh and aaaaah over your rainbow discovery bottle. Want to see it the quick way? 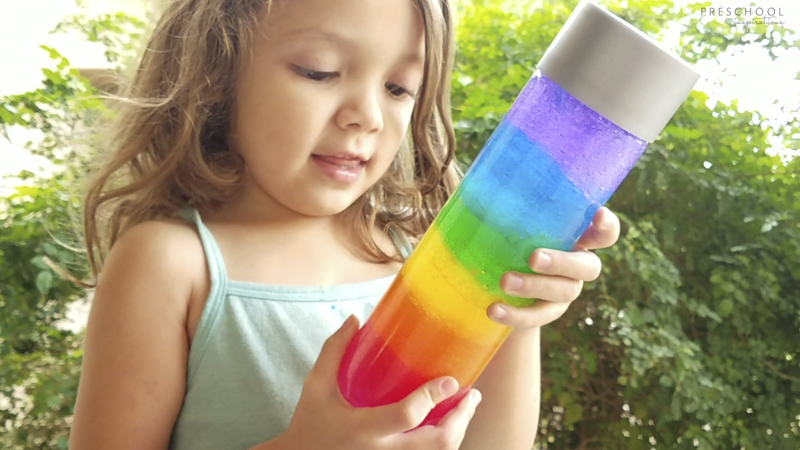 This rainbow sensory bottle is perfect to play with outside or inside. We even put it on a light table. Now it’s a glowing rainbow! These are also perfect to hold up to a window for some natural sunlight too! And after a couple of weeks, the colors will all start blending together, and it will eventually become just one color. But it’s fun to talk about that color changing process as well! My blogger friends have some more incredible ideas for discovery bottles and light play. Take a look at their incredible ideas too! I hope your class loves it, Amy! This looks cool! Just wondering what happened when you shook the bottle. Did all the colors mix? Did the colors separate? Good question, Sara Ann! The gel is thick enough that it can be shaken. The colors will eventually blend, but it’s due to time more than anything. After having this for two months, I now have three colors left: red, green, and blue. It’s still looks beautiful even though some of the colors disappeared. Suggestion, mix the colors IN the ziplock bags. It will save you the steps of mixing in the cup, then cleaning the cup for the next color. Mary, I did originally try that, but the colors turned out much darker because a bag is so much thinner than a bottle or a glass. I love that you are thinking smarter, not harder. It’s definitely doable that way, but I wasted a lot of gel myself. Thanks for stopping by! 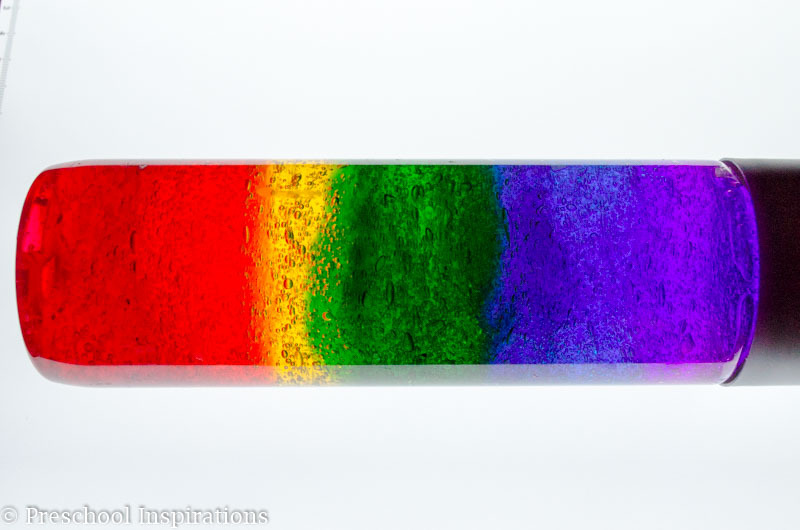 Could I use glycerine to do my rainbow?? Would I get the same effect? I’ve seen people make glycerin rainbows before, and they are beautiful! But they are really tricky to make and mix when shaken. This one is definitely much different (and easier)! Do you leave any space near the top? How do I know when a sensory bottle should have some space/air or not? Hi Jaclyn, This sensory bottle isn’t made with corn syrup — just hair gel. And yes, fill this to the top since you don’t need to shake it. I have all of the details for making this in the post, so go ahead and read it carefully. Best of luck!